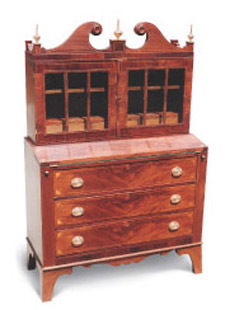 Wind River Woodworking has been specializing in fine antique furniture restoration since 1986, participating in an exclusive network of antique dealers and collectors throughout the Northeast, and buying and selling antique furniture at auctions in New Hampshire, Vermont and Long Island, New York. Owned by Adam Lempel, Wind River Woodworking provides quality fine antique furniture restoration, search services to find unique pieces, accessories, and decorative objects and can help your on-site mill work. New England doesn't have a fine piece of antique furniture that Adam doesn't know about. Heightened by the awareness the Antiques Road Show, the antique furniture market continues to be in one of its most prosperous cycles ever. Fine wood restoration and repair is not only reserved for furniture, the craftsmanship you find in mill work periodically needs to be attended to and brought back to its exquisite nature. Come in and ask Adam about antique restoration!